It explores first how the experimental methods employed by Madge and Jennings in their poetic writings may be related to the example of French surrealism; then it considers how this relationship may bear on the subsequent development of both Mass-Observation and a certain style of documentary film-making. Endnotes are given at the end of this file. Click on the note to be taken to it; likewise to return to the text. The main trends and groupings within English surrealism of the 1930s reflected the structural changes that had previously affected French surrealism, changes identified in, and conveniently marked out by, Breton’s first and second manifestoes, published in 1924 and 1930, respectively. The first manifesto had emphasised the liberation of the individual unconscious mind, laying heavy stress on the importance of dreams and on the exploitation of automatic writing methods. The kind of writing produced during this phase of French surrealism was likely to consist of highly subjective examples of what Breton referred to as ‘pure psychic automatism’. The second manifesto showed much more interest in the surrealism of everyday life, in the attempt to discover where ‘surreality resides in reality itself’—in material reality and in a public, social world. The writing of this phase showed less concern with a crisis of the subject and more concern with what Breton referred to as a ‘fundamental crisis of the object’. The second phase of French surrealism was associated, unsurprisingly, with a more self-conscious and more overt commitment to a left-wing politics, indicated most simply in the change of title of the main journal concerned, from La Revolution Surrealiste toLe Surrealisme au service de la revolution. Looking back on the change of direction, in a lecture entitled ‘What is Surrealism’, given in Brussels in 1934, Breton divides the history of the movement into two epochs: in the first, or ‘intuitive’, epoch, ‘thought is supreme over matter’, while in the second, or ‘reasoning’, epoch, the reverse is the case; thought’s supremacy over matter is replaced by the ‘supremacy of matter over mind’( Note  ). (Breton dates the second epoch as beginning after the outbreak of the Moroccan War in 1925, an event which politicized a number of the movement’s associates). Clearly, not all the English writers and artists connected with Surrealism during the 1930s can be lined up neatly behind either one or the other of these tendencies. However, I think it is the case that a number of those who subsequently turned out to be among the more interesting and significant figures did tend to concentrate their efforts on developing one of these areas rather than the other. Gascoyne, for example, despite his grasp of surrealist doctrine, in most of his 1930s work, represents a continuity with the earlier, individualist mode, inclining towards automatic writing. Whereas, it is in the work of writers initially associated with Cambridge projects and publications that one sees a more comprehensive attempt to explore the implications of the second mode. The absolutely key journal in this respect was Experiment, a magazine started by undergraduates in 1928, where the early works of Empson, Jennings and Hugh Sykes Davies appeared. The real interest of this early work does not necessarily have to do with its intrinsic qualities, so much as with the implications it carries for interpreting the course of British cultural history during the 1930s and 1940s. Jennings’s concern (shared later by Madge) for the cultural object, in existing texts, and in social reality, makes their work at once both intensely English—because it is an English social reality that they are closing with—and more closely connected with a modernist poetics than the majority of their surrealist colleagues. And it is because of their involvement in Mass-Observation, and because of Jennings’s pioneering work in documentary film, that one can begin to think about a very paradoxical line of development in English culture in which Surrealism is the formative influence upon both the origins of sociology in Britain and on a war-time and post-war new realism concerned with the portrayal of working-class culture. Jennings’s methods as a documentary film-maker betray a superficial allegiance to surrealist techniques by incorporating the accidental into a film-text that also has a layer of repetitive, obsessional imagery—a repertoire of images recurrently dominated, according to the film historians Hodgkinson and Sheratsky, by evocations of horses, both zoological and mechanical, groups singing, smoking chimneys and catastrophic fires( Note  ). The horse and the iron horse crop up again and again in Jennings’s work in all media: poetry, painting, photography, film. They have been given an individualizing, biographical origin, in the unpublished account of his childhood, ‘Beyond the Life of Man’( Note  ), a manuscript in which Jennings records his memories of horses passing in front of the family house while trains ran along the back; but they also conjoin in the first two commissioned films Jennings ever directed: Post Haste and Locomotives (both 1934); and they persist all through his work as a pair of motifs, constantly provoking questions about the role of art, and of the artist, in an age of mechanical reproduction. For Jennings, the modern artist occupies the position of the observer, effectively the Mass-Observer, who grasps the relation between any given historical moment and the series of superimposed paintings, drawings, or texts, that comprise the work of art. There is a constantly shifting temporal point, which means that the observation of the spatial arrangements has to be constantly revised. The role of the artist-observer (analogous to Madge’s notion of the ‘poet- reporter’) is an extremely active one. Two years before the rock-painting piece, Jennings recommends, in the second (February 1929) issue of Experiment, that he visitor to the Fitzwilliam Museum in Cambridge should ignore the curated order of the paintings in order to discover a personal sense of the relationship between different paintings. He is effectively recommending that one should operate a proto- Situationist derive among the monuments of official culture. In his subsequent career, Jennings established for himself the vocation of bricoleur of English culture. His works draw on, are frequently straightforwardly composed of, the elements of English culture, of both high and popular varieties. This sense of participation in a collective enterprise is absolutely fundamental to Madge’s work in his first volume of poetry, The Disappearing Castle (1937). All of the poems in that volume pre-date, but also in some sense anticipate, the formation of Mass-Observation. According to Malinowski, in his 1938 essay ‘A Nation-wide Intelligence Service,’ ‘Mass-Observation was conceived of under conditions of national stress, of dramatic circumstances which compelled every man and woman to think and feel, to react towards a definite issue—that of the Abdication’( Note  ). This perception has a particular bearing on Madge’s work, because there is a sense in which the subject matter of the early poems has to do with abdication, with the fear of renunciation, of abandonment by default, with the sense of cutting oneself off from, or of being cut off from, a collective identity, a sense of belonging. Questions of belonging haunt the early works. When the Abdication occurred, in December 1936, it was only the most spectacular expression of a set of issues that Madge had already been contemplating for several years. And of course the first major project undertaken by Mass-Observation, May 12( Note th ), concerned the coronation of George VI, which functioned as an act of national restitution, a restoration of collective identity, as Malinowski was quick to recognize, seeing it in economic terms as a regaining by Britain of the requisite amount of cultural ‘credit’. If anthropology needs to begin at home, that is partly because ‘Home is gone’ as Madge’s poem ‘In Sua Voluntade’ puts it in 1933( Note  ). So many of these texts centre on the experience of feeling strange, of being a stranger, in one’s own land. In the very earliest works, humankind is most often figured as species, positioned within geological epochs and in elemental settings, rather than as a congeries of social beings within a recognizably human history. When the social dimension is featured, it is more often than not fraught with obstruction and impasse, as in ‘The Hours of the Planets’(1934). A marginal note— ‘The rise of the bourgeoisie’—is offered in apparent explanation of a process of socialization which involves ‘All equal all in inequality / Looking not one to one but each from each / Different in self-indifference’( Note  ), where the very concept of social relations is founded on antithesis. The structures of these early poems are frequently abdicative, obliging the reader to progress through a dereliction of meanings and occasionally of syntax in a way that corresponds to, without exactly matching, the procedures devised by Jennings during the same period. Almost exactly contemporary with Madge’s ‘Bourgeois News’, which I shall discuss later, is Jennings’s ‘The Boyhood of Byron’, first published in the December 1936 issue of Contemporary Poetry and Prose, edited by Roger Roughton. One of the reasons that Jennings chooses to write about Byron is because Byron represents for him the paradox of a poet of rational control in a Romantic age. And it is significant that in the same issue of Contemporary Poetry and Prose that ‘The Boyhood of Byron’ appears in, Jennings also publishes a review of Surrealism, the volume edited and introduced by Herbert Read and including articles by Breton, Hugh Sykes Davies, Hugnet and Eluard. Jennings uses most of the space available to him in order to resist Read’s idea that Surrealism should be founded on ‘the universal truths of Romanticism’, advocating in place of this a re-use, or a new use, of classicism, which in his view is currently being misused by a ‘classical-military- capitalist-ecclesiastical racket’ ( by which he can only mean T.S.Eliot)( Note  ). It is very odd, but a matter of record, that some of the most grammatically decorous and self-consciously polished writing of the period comes from the Surrealists Humphrey Jennings and Hugh Sykes Davies. It is a paradox which is caught nicely by the references to Greece in the text: these include a reference to Delphi, one of the original sources for oracular speech, for the texts of ‘psychic automatism’, and yet the reference is enclosed within a paragraph of very carefully poised and regulated writing, using proper sentence structure. Jennings’s use of existing materials in his poetry—which is reflected in the way he painted as well, working the subjects of his canvases up from originals in photographs, postcards and prints—when put alongside his recommendation of classicism, does give his work a modernist dimension. Unlike perhaps the majority of Surrealists, he was concerned to preserve the culture of the past, not jettison it; indeed, his work insists on a continuity with it. Where both Jennings and Madge diverge most obviously from the priorities of high modernism is in their attitude towards popular culture. Jennings actually planned to call a volume of his poems of the 1930s that never came out, Popular Narratives, and in any case he habitually ascribed his prose poems of the 1930s to the genre of ‘reports’. The notion of the poem as ‘report’ and of the poet as ‘reporter’ is one of the things that links Madge’s and Jennings’s procedures as Surrealist writers with their activities as Mass- Observers. The point of view of the Mass-Observer is absolutely crucial here, because it contrasts dramatically with other points of view that are given a high profile during the 1930s. The poetry of the period is frequently associated with the hawk’s eye view; this is by no means as uniformly present in those poems of Auden where it has often been identified by critics, but it does appear with sufficient frequency in his work and in that of his epigones for it to have become a standard topos in terms of the reception of the work. The poetry of the Auden gang and the films of Jennings share a rhetoric of apostrophe, in which the reader or spectator is enjoined to ‘observe’, ‘inspect’, or ‘look at’ the data of English social reality : ‘Look, stranger, at this island now’ begins one of Auden’s most famous poems. The difference between Auden and Jennings contrasts the point of view of the hawk or the helmeted airman, a position of supreme advantage, from which to dominate imaginatively a given landscape and reduce it to order, with the point of view of the Mass-Observer, which is that of the figure in the crowd, whose view is frequently obscured, by other passers-by and by traffic; which is shifting, transitory, partial. The ‘stranger’ in early to mid-Auden, and in the readings of that material, is a completely different figure from the ‘stranger’ in Jennings and Madge. And the quality of observation employed can be different as well: the ‘look’ of Auden’s stranger is associated with spying and surveillance, with an exclusive, masonic knowledge; the ‘look’ of the Mass-Observer turns that process of introversion inside out, to display, and share with others, the knowledge of a public reality—the observing is part of a process of accessing information rather than of encrypting it. Jennings’s last textual project, actually left unfinished at his death, was Pandaemonium, that collection of extracts from the 18( Note th )and 19( Note th )centuries bearing witness to the coming of the machine and its impact upon the texture of everyday life. What Jennings was doing, effectively, with this project was awarding Mass- Observation, retrospectively, to the 18( Note th )and 19( Note th )centuries—treating the authors whose words he borrowed as if they were members of one of the survey teams. In the Introduction to this volume, put together by Madge out of notes left by Jennings, there’s an account of the motivation for this project that makes it sound like an attempt to repair a breach that has opened up in the cultural fabric as a result of something that resembles very closely Eliot’s notion of the ‘dissociation of sensibility.’ Jennings/Madge argue that there has been an increasing specialization of discourse coincident with the progress of the Industrial Revolution, which necessitates the presentation of a multiplicity of viewpoints in a quasi-simultaneous fashion, using the methods of poetry. The trouble with poetry, they say, over the last two hundred years is that it has been expropriated by poets. What binds together the separate documents, the sometimes very disparate elements of the text, is ultimately the movement of the prose. Semantically, ‘Bourgeois News’ is full of inconsequentiality. Syntactically, and rhythmically, the sentences, the paragraphs, and finally the whole text, are bound together into some sort of unity. Most of Madge’s jokes work because he manages to achieve a certain unity of tone which gives the impression of a scientific attitude. It is what the prose sounds like when you read it aloud (or in your head) that binds it together: the music of a certain kind of speech, and that perhaps is reminiscent of something that Jennings once said in connection with his own methods of composition in creating documentary films: ‘any two shots can be cut together—the soundtrack will connect them.’( Note  )(A good example of that would be Listen to Britain (1942) with its ‘anticipatory soundtrack’, where you get the sounds of one sequence—of the next sequence—coming in and overlapping with the last few images of the previous sequence, so that there is a constant syncopation of sound and image). But the soundtrack of ‘Bourgeois News’ holds all the dangers of a voice-over enforcing connections; it does not allow the reader to assume the responsibility for editing together, collating, the disparate materials of which it is composed. Malinowski was aware of the necessity for the editors of Mass-Observation not to abdicate from the responsibility of providing an objective interpretation of subjective data, and yet he referred to the editorial team as the ‘General Staff’, a phrase which is immediately suggestive of the facility with which that interpretation might become subjective, a form of spokesmanship, a method of speaking for subordinates, rather than letting equals speak for themselves. 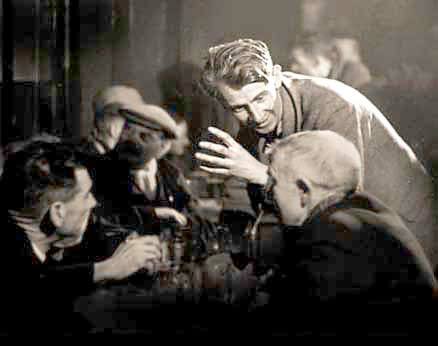 The model of spokesmanship, of public speaking, of political oratory, is endemic to the literature of 1936; it is most spectacularly evident in Auden’s ‘Spain’, and it is most destructively gaining ground in Upward’s prose. Malinowski claimed that Mass-Observation would never be allowed in a totalitarian state; in ‘Bourgeois News’ it may be that autocratic and democratic perspectives are still being held in tension. ‘Bourgeois News’ is one of those texts in which history is Janus-faced; a movement which could go in either this direction or in that. Andre Breton, ‘What is Surrealism’, in What is Surrealism: Selected Writings, ed. and introduced by Franklin Rosemont, (London, 1978) p.116. Anthony W. Hodgkinson and Rodney E. Sheratsky, Humphrey Jennings: More than a Maker of Films (Hanover and London, 1982) p.xxiii. Quoted in Humphrey Jennings: Film-Maker, Painter, Poet, ed. Mary-Lou Jennings (London, 1982) p.6. Malinowski, ‘A Nation-Wide Intelligence Service’, in First Year’s Work 1937-8 by Mass-Observation, ed. Charles Madge and Tom Harrisson (London, 1938) p.108. ‘Surrealism’ in Contemporary Poetry and Prose, edited by Roger Roughton (December, 1936) pp.167-8. ‘The Boyhood of Byron’ in Contemporary Poetry and Prose, edited by Roger Roughton, (December, 1936) pp.146-7.